magnificent and noble society: the birth of democracy, economic growth, and the flourishing of great artistic, literary and philosophical achievement. Scholars have long thought that there existed three status groups – citizens, slaves and foreign-born residents – in this Golden Age of Athens. 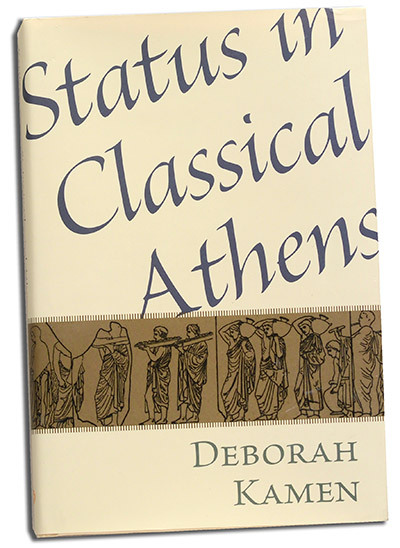 In her book, Status in Classical Athens, Professor Deborah Kamen demonstrates that there was in fact a much broader spectrum of statuses. She carefully delineates ten separate levels, from freeborn male citizen to chattel slave. She describes for each the associated rights and privileges as prescribed by law and how these functioned on a practical and daily basis. The picture that emerges is far from the peaceful and autonomous system that has been portrayed in the past. Status was precarious and often in flux. Although their legal status was acknowledged, many citizens were unable to exercise their lawful rights due to lack of knowledge or financial capacity. Professor Kamen looks at the principle of equality in Athens and reveals the tensions found between the ideology and the reality.